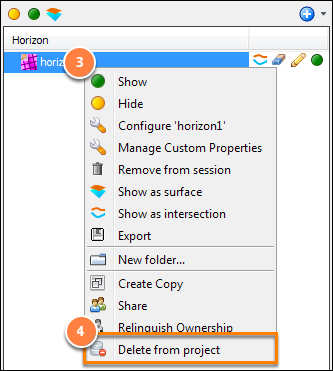 If you own an object, you can delete it from the project database. This affects all users and sessions. In the Control Panel, open a product tab (i.e. horizon, polygon, probe, etc). Select the item(s) to be removed. These menu options will only be available if you are the owner of the items (see Multi-user Considerations). In the Control Panel, open a product tab. Click the Add icon at the top right and select Load (things) already in the project. This will open the Search dialog. 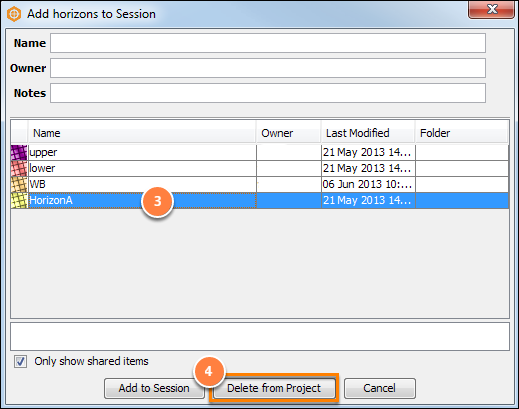 Select the item(s) that you want to delete from the project database.